Thank you very much to “H”, one of the NHM Writers, for today’s review. 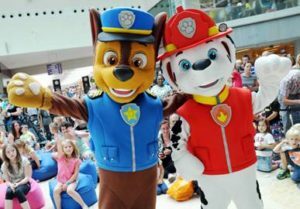 On Sunday 24th July, Festival Place hosted story time with Paw Patrol. The event had been advertised around the shopping centre for some time. On the day the session times were shown on a sign at the entrance to the ‘pen’ as well as on the Festival Place Facebook page. Sessions were held in the square outside M&S. We went to the final session of the day at 3:30pm. The first people in the queue were there at 3pm and they started letting people into the pen at 3:15pm. There were maybe 50 beanbags on the floor for the children to sit on (parents were asked not to sit on beanbags). As far as I could tell everyone got in who had been queuing although not all of the children got a beanbag. There was also the option of standing around the outside of the pen and a lot of people were doing that. At 3:30 Marshall and Chase arrived in costume along with a storyteller. There was some call and response and cheering to ‘warm up’ the crowd and then two Paw Patrol stories were read – one about pirates and one about a birthday party. I had my three year old and baby in tow. The three year old is a huge paw patrol fan and was very excited about meeting Paw Patrol. He had a brilliant time and a huge grin on his face all the way through. The baby was a little less impressed but sat on my lap relatively still watching the action. The storyteller was enthusiastic and did her best to bring the stories to life. Unfortunately the sound wasn’t great (I would guess due to the space) and many of the children had clearly stopped listening after a while. Despite this, looking around, all of the children seemed happy to watch Chase and Marshall prance around and weren’t too concerned whether they could follow the story. Overall we had a really good time and I would go to this kind of thing again. I had avoided them in the past thinking they would be ridiculously busy but it wasn’t nearly as bad as I’d expected. Having said that, I have heard that sessions earlier in the day were extremely busy and a little chaotic. There may also have been some technical issues earlier in the day. Parents – be prepared for sitting on the shopping centre floor! It’s fine to queue up with pushchairs but you will then be asked to leave them at the back of the pen. Once you’re in the pen you’re pretty much in for the whole session so if you think your child won’t want to stay for all of it (it was maybe 20-25 mins long) you may be better off getting a good spot standing on the outside of the pen. If you want a good seat and view, it’s worth queuing up early. Prepare your child that they probably won’t get to ‘meet’ the characters – one child did try to go over and say hello at the end but Chase and Marshall were ushered away. All Festival Place facilities are available during these events including baby change/family toilets/restaurants etc. Festival Place or other town centre car parks. ← North Warnborough Toddler Group – open during the holidays!